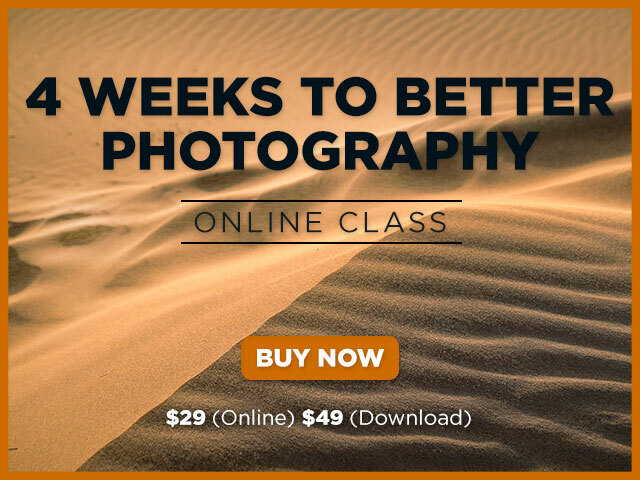 This is a no-nonsense beginner photography course that doesn’t get hung up on confusing jargon or weighed down with lots of technical terms. Downloadable video files available. Know you need to up your photography game, and finally come to grips with using your camera? If you are a beginner to intermediate photographer, 4 Weeks to Better Photography is the answer to your photography failures. This is a no-nonsense photography course that doesn’t get hung up on confusing jargon or weighed down with lots of technical terms. Because we know how crazy life can get, all the lessons are available to download onto your mobile device (you must download to your computer and unzip them first). That means whether you are on a boat in the middle of the ocean, on an airplane, or in the desert, you will have all of the lessons at your fingertips to access anywhere at any time. You can move through the course on your own time at your own pace. Speed through, or take your time, moving on only when you feel comfortable with the material.